Like many physicians, I deal with plenty of stress. To start, the very nature of a physician’s job is stressful — as we typically deal with people who are not well and are suffering. In addition, we are also forced to navigate the realities of practicing medicine in a changing world — changing payment models, decreased independence, patient access issues and malpractice risk, just to name a few challenges. Then, there’s technology on top of all this. Many physicians find that new technology simply adds to their stress. 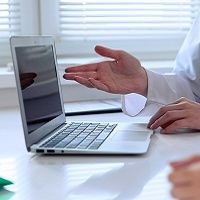 Awkward user interfaces, onerous documentation and difficult interoperability are just a few of the issues that create tension headaches for physicians. My experience with technology has been quite different than other physicians’ – and I am hoping that my peers can come to see and embrace technology as I have. Indeed, I actually find technology to be a great stress reliever. While I rely on swimming and weightlifting to relieve stress outside of the clinic, I find that technology can help to relieve stress as I practice medicine day in and day out. Always prepared. With an electronic medical records (EMR) system in place, I can see what is on the schedule and know what is coming my way. As a result, I can delegate duties to the surgery scheduler, chemotherapy coordinators or medical assistants. And, I can concentrate on what I need to do – and more acutely zero in on patient care. This helps me to see more patients and provide better service than I did when I was working with paper charts. Able to complete complex tasks much quicker. I also use advanced technology in the operating room that makes my work-life a bit less stressful. For example, I use both a Da Vinci robot and sentinel lymph node mapping technology. Both of these help me perform surgeries much more efficiently – and reduce the overall time that I spend in the operating room. Aware of what’s happening around me. Our medical practice manages patient flow with Versus Advantages™ Clinic, utilizing real-time locating system (RTLS) technology. With this system, patients, clinicians and staff wear badges that make it possible to know where patients are and how long they’ve been waiting, who has seen the patient, and who needs to see them next. In essence, the RTLS acts as an air traffic control system, providing real-time communication of patient and provider status as they move throughout our large facility, which spans three floors and includes more than 30 exam and procedure areas and more than 40 infusion chairs. As a result, I don’t work in an environment that has me guessing (and stressing) about what’s next. Instead, my staff knows which rooms and chairs are available and which need to be turned over; I know which patient needs me next; exactly where the patient is in the treatment process; and the status of lab orders and medications. Treat happier patients. Because oncology care is so complicated – often requiring patients to see a variety of caregivers and receive an array of services in one day – the complaints about wait times become even more frequent and furious. When patients wear badges, the RTLS can pinpoint exactly where they are and how long they've been waiting and call out patient status — such as “ready to be seen,” “with physician,” or “in X-ray.” The RTLS can also track room status and, therefore, identify where patients and caregivers need to go next. As such, the RTLS helps the patient visit progress at a much faster pace, reducing time spent in the waiting room, as well as non-productive time spent waiting for the next stage of care. The result is more time spent receiving care, less time spent waiting. As a result, patients are happier with their care and I am happier and less stressed because I am dealing with patients who are more relaxed. David P. Michelin, MD, MPH, is board certified in gynecologic oncology and seeks to provide the highest level of care with state of the art technologies. He earned his medical degree at Michigan State University and completed his internship at Blodgett Memorial Medical Center. After completing his residency at the Medical College of Wisconsin, Dr. Michelin went on to complete a Fellowship in the Department of OB/GYN at Loyola University Chicago. He currently practices at the Cowell Family Cancer Center in Traverse City, Michigan, affiliated with Munson Medical Center. He is a clinical assistant professor at Michigan State University.